IF THIS strange creature growled at you, you wouldn't know whether to run from his sharp claws or pat him on the head and give him a biscuit. 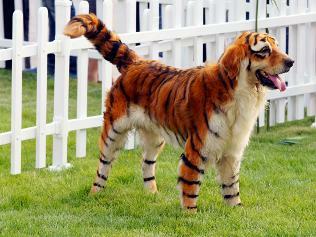 But it's actually a dog, a victim of the latest craze among owners in China to dye their pets to look like other animals. 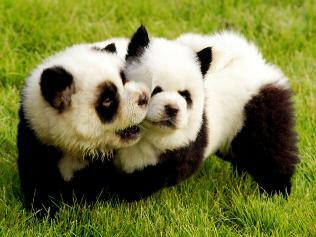 One young pup even found itself turned black and white to masquerade as a baby panda. The Chinese are always quick to embrace bizarre trends and it is not unusual for owners to take their dogs to grooming parlours where they are not only given a shampoo and trim, but a multi-coloured dye job as well. Quite what the animals might think about it is another matter.